Winter is Here. Is Your Equipment Ready? Farmers are outside year-round, using equipment throughout the winter months for livestock care, snow removal and even digging into frozen ground. The importance of proper equipment care and maintenance in cold, snowy weather is amplified due to wintry conditions. Especially in newer, technology-driven machines, electronics are at a greater risk for damage in the cold. Sub-freezing temperatures not only slow response time, but battery-powered electronics will also lose their charge faster. Both the engine and electronics can be damaged beyond repair if they freeze over the winter and then thaw in the spring. Before the cold arrives, replace the lubricant in each compartment with one featuring the highest oil viscosity allowed based on your region’s typical ambient temperature. Store starting fluids at indoor room temperature, and only inject starting fluid while the engine is cranking. Use coolant designed for use in the lowest expected outside temperature. To avoid damage, allow the engine to cool before adding antifreeze. If the engine isn’t warm enough for startup, obstruct the radiator with a piece of cardboard to block cold air. This will increase engine temperature and heat hydraulic fluid more quickly. After startup, let the engine run until it reaches operating temperature to help prevent the intake and exhaust valves from sticking. The battery should be kept fully charged and warm. In subzero temperatures, it may help to bring the battery inside to store it at room temperature when not in use. To avoid fires, scorched wiring or a melted battery case, never use a torch or other open flame to heat components. Top off fuel after every use to prevent freezing. Check the air intake daily for snow and ice, and remove all dirt from the tread so it does not freeze into the tires. Use dry nitrogen gas to inflate flat tires to eliminate ice crystals, which can hold the valve stem open in the tire. You can find this at your local dealer. All rubber parts, including hoses, tires, drive belts and electrical wiring should be inspected weekly for cracks and other damage. A general outline for proper machine use is only the start of cold weather preparation. Conditions, applications and resources vary greatly across the country. 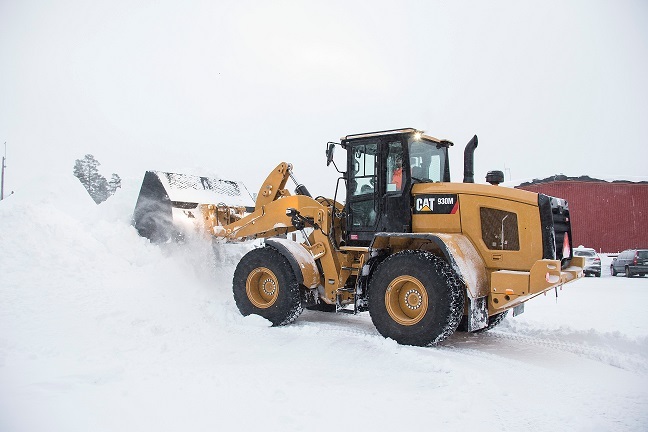 For more information on winter machine maintenance and Cat® Agriculture equipment solutions, visit Cat.com. Contact your local Cat® Dealer.